What exactly are shin splints? Outside the medical field, this term is used as a "catch all" phrase to describe numerous different types of lower leg pain. From medial compartment stress syndrome, stress fractures, and tendonitis, shin splints can be any number of problems. But one thing is common among them all. They can be a sport stopping nightmare, causing severe pain and discomfort. In order to better understand this catch all term, lets look at the different areas that can be painful in the lower leg. While shin splints can often refer to any type of low leg pain, different treatments may be neccessary, depending on the exact condition present. Classifying the area of pain can narrow the possible diagnosis, and treatment options. Pain in the muscular area on the outside of the front of the leg is very commonly referred to as shin splints. This pain is usually present during and after activity, and radiates from the edge of the tibia laterally. Pain along the bone is not as common. Often this discomfort is present in both legs, and is seen at the beginning of an athletic season, or after starting a new activity. The most common cause of pain is a combination of overuse and poor flexibility of the calf. As you begin a new activity, your muscles are not conditioned for this increased stress level, and must go through an accomadation period to adjust to the stresses. Coupled with poor calf flexibility, the amount of stress on the anterior muscles of the lower leg lead to inflammation and pain. Another common complaint is pain along the inside of the lower leg, along the edge of the tibia. Better known as medial tibial stress syndrome, it results in an inflammatory response along the insertion of the soleus muscle. This muscle of the calf inserts along the medial (inside) side of the tibia, and the area where it inserts can become inflammed due to stress. Poor calf flexibility is often a primary cause of medial tibial stress syndrome. 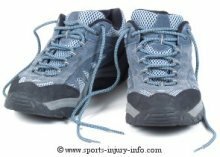 Other factors that can result in this injury include rapidly increasing activities without a gradual accomodation period, as well as biomechanical concerns with the foot and lower leg. The other most common area for pain in the lower leg is pain along the tibia. This is can also be classified as "shin splints". Pain directly on the tibia, especially if it is localized to one very specific spot can sometimes indicate the possibility of a stress fracture. While the term shin splints can refer to several different conditions, there are several prevention techniques that can help with all of the different conditions listed above. One of the easiest ways to prevent shin splints, as well as many other injuries, is to gradually increase physical activity over a period of several weeks. The body is built to withstand the stresses placed upon it, and to adapt to these stresses. This is the basic principle for increasing strength, power, and endurance. As you increase your activity, your body becomes accomodated to these stresses, and gets stronger. However, if you increase too quickly, you overload the body's ability to recover, and this leads to pain, inflammation, and ultimately sets back your progress. Whether you are involved in an organized competitive sport, or just participating in recreational activities, start off slow, working towards a goal of maximum participation in 2-3 weeks. Gradually increase your intensity and duration of exercise to prevent overuse problems. In addition to gradually increasing your activities, proper warm up and stretching is also vital. Flexibility of the calf muscles is very important. If the calf muscles are tight, this can lead to increased stresses in the lower leg, as well as altering the biomechanics of the foot and lower leg. Calf stretching should be performed prior to and following activity, and should be done every day in order to make gains in flexibility. Proper footwear is important for prevention of injuries. Making sure that you have shoes that support your arch, and that are designed for the specific activity you are participating in is essential. Everyone's feet are different, and this requires different types of shoes. Talk to your certified athletic trainer, or the salesman at the store for more information on proper footwear. While different conditions may require different treatments, the best way to begin treating shin splints is to rest, ice, and stretch. Depending on the type of injury you have, this may or may not resolve your symptoms. Icing for 15-20 minutes following activity is a good idea if you are experiencing pain. In addition, reducing your intensity or frequency of activity can also help. This will give your body time to recover, and to get stronger, gradually accomodating to your activity levels. And of course, stretching will help to reduce the overall tightness of the muscles. If you have pain and rest, ice, and stretch, but do not see a significant change in your pain and discomfort, please seek medical attention from your certified athletic trainer or family physician. While shin splints are commonly seen in all kinds of sports, the actual problems can vary significantly. Following several prevention techniques such as gradually increasing activities, proper warm up and stretching, and wearing proper footwear can help to prevent this injury, and keep you in the game.